“There is but one truly philosophical problem, and that is suicide.” Thus begins Albert Camus’s seminal work in existential philosophy The Myth of Sisyphus. The premise of the book is an ancient legend in which the Greek hero, Sisyphus, is eternally condemned to the task of pushing a rock up a mountain, knowing very well that it will roll back down. The million dollar question here is: how does Sisyphus commit himself to a life without purpose, even bordering on the absurd? If his perception of reality were to change, would he see a silver lining? Camus acknowledges the significance of understanding the nature of the universe, but rejects the likelihood that such an understanding would effect our assessment of life’s worth. I beg to disagree. It is true that reality is revealed to us through our experiences. But its arena is not just the world we inhabit. The overarching lesson from the past two centuries of scientific discovery is that our senses are often a misleading guide to the true nature of reality. In his book, The Fabric of the Cosmos, physicist Brian Greene aptly surmises this experience as “gazing at a van Gogh through an empty Coke bottle”. Lying just beneath the surface of our perception is a world that will take our breath away. Through the tireless efforts of eccentric geniuses, mad scientists, and indefatigable innovators, we have been able to peel away layer after layer of this beautiful reality and come one step closer to understanding it. I feel that any assessment of existence that fails to incorporate the insights provided by modern science is not only incomplete but also juvenile. Albert Einstein gave no weight to the idea of a personal God who could meddle at whim in the affairs of mortal men. Few scientists or their discoveries have achieved such ubiquity as Albert Einstein and his Theory of Relativity—with perhaps the notable exception of Sir Isaac Newton. A downside of such fame was that his statements and remarks were often blown out of proportion. So when Einstein claimed that he was religious, religious leaders latched onto his words and sought to use them in order to sanction their brand of God Almighty. But there is a quote that is frequently attributed to the great physicist: “Make everything as simple as possible, but not simpler.” Wary of being quoted out of context, he sought to express himself clearly on the subject, both for himself and for the sake of those who wanted a simple answer from him. So in the summer of 1930 he composed a credo—What I Believe—that he released to a human rights group and later on published. Throughout his life, Einstein maintained that underneath all the discernible laws of physics, there is a mysterious force, subtle and intangible, that is responsible for the harmony that we see around us. Veneration for this enigmatic power constituted his religion. He wrote, “To sense that behind anything that can be experienced there is something that our minds cannot grasp, whose beauty and sublimity reaches us only indirectly: this is religiousness. In this sense, and in this sense only, I am a devoutly religious man.” The mandate of science, according to him, was to hack away at this mystery and reveal to us those fundamental laws of nature that governed the ‘music of the spheres’. He gave no weight to the idea of a personal God who could meddle at whim in the affairs of mortal men. A natural conclusion from this world view was Einstein’s belief in causal determinism. The world obeyed laws and we are just as bound to them as the planets that revolve around the stars. Were the immutable rules of nature revealed to us, it would be possible to predict with certainty if it will rain tomorrow at 4.15 in the afternoon and whether Mr. Sharma, a government clerk working in Jhumri Tilaiya, will choose to vaccinate his third child. Obviously, this was incompatible with the notion of free will, the very basis of moral behaviour and ethical freedom, and outraged several of his fellow physicists, including Max Born, who looked upon a deterministic world as downright ‘abhorrent’. In light of the groundbreaking success that his theories have had over the last 100 years, I found it a bit difficult to digest the notion that someone like Einstein could be religious. In fact, he was more critical of the fanatical atheists who “lacked utter humility toward the unattainable secrets of the harmony of the cosmos”. But that is when his words came to the rescue. 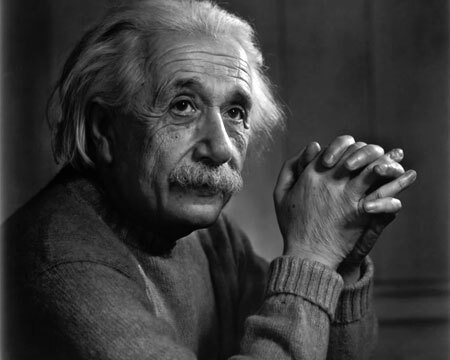 Einstein believed that only a person thoroughly imbued with an aspiration for truth and understanding can do science. The source for that inspiration, however, lies in the sphere of religion. He summed up this relationship by means of a pithy saying which has since then become famous: science without religion is lame, religion without science is blind. But there was one religious concept that he could not accept. The bone of contention between religion and science, Einstein argued, lay in the concept of a personal God—someone who could randomly alter the course of events once they had been set into motion. A scientist on the quest for discovering the laws of reality must reject the notion that divine will, or for that matter human will, can influence this cosmic causality. But even during the course of his life, a new sun was looming on the horizon of modern science. Few discoveries in recent times have so drastically affected our understanding of the machinations of the universe. Quantum Mechanics and the uncertainty woven into its fabric were looking to deliver a knockout punch to the idea of a deterministic world. Deeply troubled by this assault on the very nature of reality, Einstein mounted a series of attacks against this emerging field in his later years. Physicists, he would emphasise, are not bookies and physics is not in the business of determining odds. Did he succeed in his mission or has our understanding been subjected to yet another upheaval? What implications does Quantum Mechanics have for our grasp over reality? More importantly, is this the only reality that exists? I will try to elaborate on some of these questions in the next article in this series. ‘Roads to Reality’ is a series of articles that looks at how our understanding of reality has changed in light of modern advancements in science, particularly in the area of quantum mechanics. By Isabella Ricci · When fighting against forces much greater than yourself, and so much beyond your control, there’s only two ways to go about things. Looking forward to the rest of the series. But you do know that there’s a pack of wolves circling you just around the corner ready to eat you alive if they can? Of course, I mean this in terms of ‘constructive criticism’ and not cannibalism. enjoyed this article..when is the series due? better to be cannibalized than stay ignorant.